Recently, I addressed the question "What's The Point Of A JD/MBA?" If you're someone who is thinking about pursuing a JD/MBA, it's important to familiarize yourself with what the application process looks like and to understand the different options among the various schools you may end up considering. For most schools, doing a JD/MBA requires separately applying to and being accepted by each school. This means taking the LSAT, individually applying to law school, and getting accepted, as well as separately taking the GMAT, submitting a distinct application for business school, and getting additionally accepted there. It is possible to get accepted into one program and not the other. If you are applying to both schools separately, you will often be asked to mention in your application that you are doing so, and the schools will likely also ask you to submit a short essay explaining your interest in the dual-degree. At some schools, including Penn and Northwestern, instead of applying to both schools separately, you submit a single, integrated application for the JD/MBA program. This will usually (but not always) still require both an LSAT and a GMAT score, but it is nice to have one application instead of two. The table below illustrates which top programs require separate versus integrated applications. For the vast majority of programs, students can also apply to the dual-degree program during their first year of attendance at either the law school or business school. Thus, 1Ls interested in doing a JD/MBA can apply to the business school during their first year of law school. For four-year programs, students can also apply during their second year of law school. For both three-year and four-year programs, students who are MBA1s will need to apply to law school during their first year of business school. The advantage of waiting to apply to do the joint-degree until after matriculating at one school or the other is that you cut down on the total number of applications you will need to do. Instead of applying to ten law schools and ten business schools, you will only have to apply to ten law schools and one business school (or ten business schools and one law school). Another likely, albeit debated, advantage is that matriculating at one of the schools will boost your chances of getting accepted into the other. It's unclear how true this is, but I imagine there is some non-trivial boost that comes about from this circumstance. For example, if applying to Harvard Business School, having already been accepted into Harvard Law School adds another data point to your application to demonstrate your intellectual strength and ability. In addition, because admissions directors want to accept students that will actually choose their school, you are considered a "safer" candidate because you're only applying to this one school; if you're at NYU Law and applying to NYU Stern, Stern has confidence that you will accept the offer if they give you one. This matters to them since yield (the percentage of offers accepted) is one factor that determines their ranking. Another advantage to staggering your applications is that it allows you to spend more time on each program's application. Instead of having to focus on the LSAT and GMAT at the same time, in addition to law school and business school essays, you can first focus on your law (or business) application, and then once that is finished, you can move onto your one application for the other school. Applying to law or business school in and of itself can be very time consuming, both in terms of standardized testing and overall preparation of your application materials. Thus, staggering the process can help you to put your best foot forward for both application cycles instead of compromising when applying at the same time. A significant disadvantage of waiting to apply to the joint-degree program is that you take the risk of not getting into the business or law school of the university you are already attending. 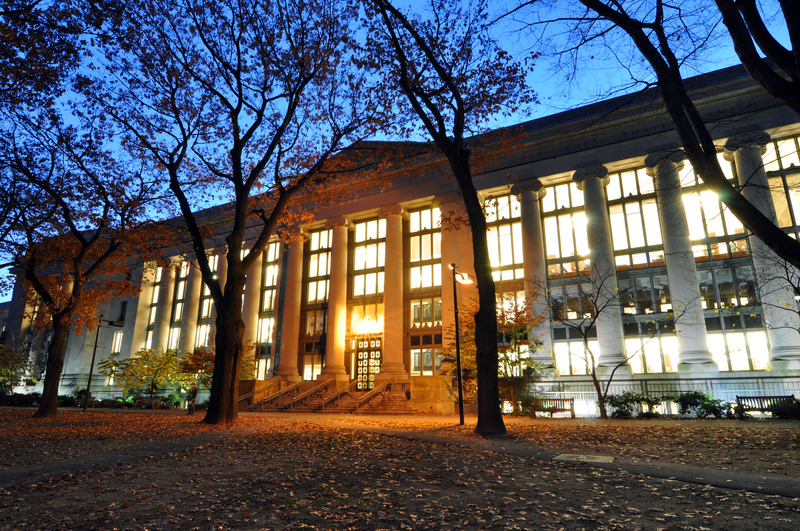 If you know you want to do the dual-degree and you matriculate at Columbia Law School, there is no guarantee (to put it lightly) that you will get into Columbia's business school. And if you don't get in, that means that doing the dual-degree will require you to apply to business schools outside of Columbia University, which usually means doing a completely separate program that will require a total of five years across the two degrees instead of the usual three or four. In other words, by applying to just law school or just business school initially, and then matriculating at one or the other, you are essentially tying yourself to that university if you want to do the dual-degree in three to four years. 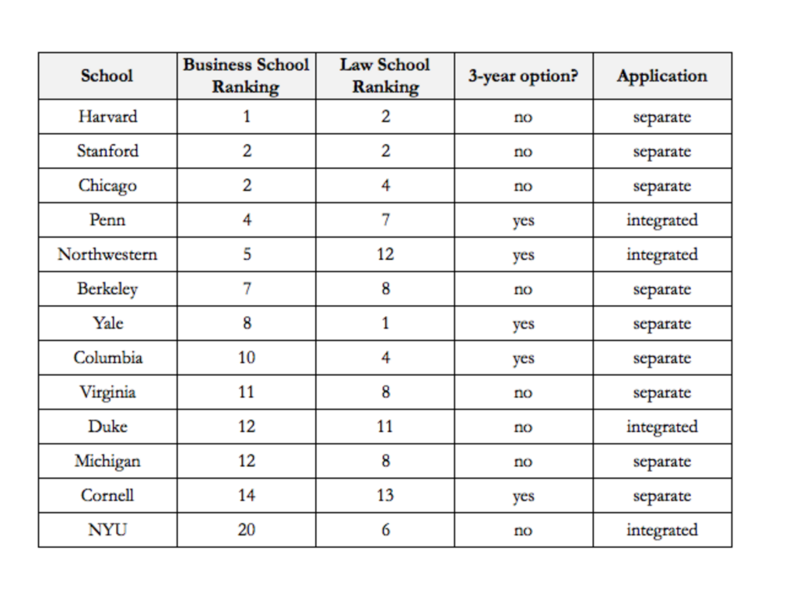 Thus, many students prefer to apply at the same time so they can see which programs they are able to get into both the law school and business school before choosing where to go. One of the main differences among JD/MBA programs is the length of the program itself. As the above table demonstrates, a handful of JD/MBA programs allow students to complete the program in three years. For the three-year program, students spend one year each at the law school and business school and then spend their third year split between the two schools. The summer between the first and second year is usually spent in school as well, meaning that students in these programs only have the summer between their second and third years to do an internship. Columbia is one of the few schools where students can do an internship both summers instead of going to school for the first summer. It's also worth noting that the majority of schools offering a three-year program also offer four-year programs for students that, for whatever reason, would prefer four years over three. Some schools, such as Yale, may put a cap on the number of students that can be admitted to the three-year program, but often, choosing between the two is generally a matter of personal preference for the student. Opting for a three-year program instead of a four-year one comes with a handful of notable benefits and costs. The main advantage of doing a three-year program is that you can begin your career sooner. Because you're entering the workforce one year earlier, you can start making money earlier. In terms of money, some people also think that another advantage of the three-year program is the reduction in tuition cost; they believe that because you are going to school for three years instead of four, you don't have to pay for that fourth year of tuition. This is a false assumption. The three-year programs will usually prorate tuition such that the tuition costs of three year and four year programs are essentially equivalent. For example, as noted here, Columbia's JD/MBA program tuition charges are roughly equivalent for both three-year and four-year students. An under-appreciated advantage of the three-year program is that JD/MBA students will graduate with the same cohort of law students that they began school with, assuming that they do their first year at the law school. 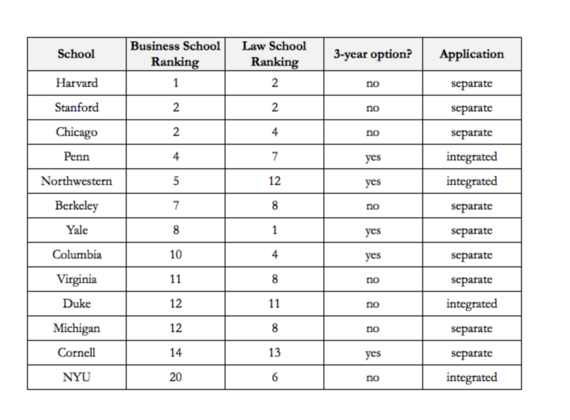 Four-year JD/MBAs, on the other hand, miss out on the opportunity to be the same graduating year as their law school classmates unless they start business school first (which tends to be less common). If three-year students do law school the first year and business school the next, this means they also will graduate from business school the same year as their cohorts at the business school. It's unclear to what extent this matters in the long run, aside from being able to attend the same class reunions throughout the years, but I know many four-year JD/MBAs who bemoan the fact that they are considered a different graduating class than their law school friends. For four-year students, if they do law school their first two years, they can graduate alongside their business school cohorts; however, unless the program allows students to get their law degree after three years even though they are doing the joint-degree program in four, these students will not be in the same graduating year as their law school cohorts from 1L year. The largest drawback of doing a three-year program is that you lose anywhere from one to two summer internship opportunities. For some, this might not be a big deal. If you know you want to be a lawyer, you only need one summer at a firm to get there. However, because a lot of JD/MBAs aren't sure what they want to do when they graduate, having multiple summers to try out different things is a great opportunity to test hypotheses. Do I want to do investing? Am I a good fit for consulting? Is Big Law right for me? What about government work? Instead of rolling the dice across one summer and hoping for the best, a four-year program means that you can spend one summer in the law, one summer in business (doing banking, consulting, operations, or something else), and one summer trying something different (working overseas, joining a startup, doing a non-profit, etc.). If you only have one summer to do an internship, you have to choose between law and business; if you end up having a bad experience, well, then that makes it even more difficult to figure out what you can and should do after you graduate. Thus, having multiple summers is a great luxury for those JD/MBAs that are unsure of their career path. Another downside to the three-year program is that it can seem rushed. Law school normally takes three years in and of itself, so squeezing in an additional two-year degree during that same timeframe can cause a lot of chaos. Doing the three-year JD/MBA usually means taking a greater number of credits each term compared to JD or MBA students, and on account of a busier academic life, it may also mean having to sacrifice other opportunities, such as externships, club leadership, or social activities. For some, this may be a small sacrifice to pay, but for others, these outside-the-classroom opportunities and experiences are often just as valuable, if not more valuable, than the in-classroom experience itself. Thus, students considering a three-year program must decide what tradeoffs they are willing to make. Students considering applying to a JD/MBA program have many decisions to make: should I do a three-year or four-year program? Should I apply at the same time or stagger my applications? At which school should I start first? Each program offers its own nuances in terms of the application process, as well as degree requirements and options. Students interested in pursuing a JD/MBA would do well to make sure they understand the variances across the different programs and consider which programs and options best align with their individual goals and interests. For more strategies on college and law school admissions process, visit www.synocate.com.